A recent survey of the UK's tech workers by Juniper Research has found that 65 percent of UK tech workers think Brexit will have a negative impact on the global tech industry. The City of London may be home to lots of startups and funds alike, but it’s a little early to start ringing the death knells, since the Brexit vote was simply an expression of interest for UK to leave the EU, and it could be overturned. However, the financial earthquake that hit Britain after the vote has had a very real effect on African economies, especially South Africa, where many large companies are co-listed on the London Stock Exchange. The UK is one of Africa’s major trading partners, meaning that a British recession could have a lasting impact on the continent. Additionally, Africa's tech giants such as Naspers, Africa Internet Group and Interswitch have deep links with the UK, and so they could wind up with significant losses from this. These companies use London as a hub for many of their activities within Europe and there will undoubtedly be implications for them with the UK leaving the EU. For many African startups that are trying to figure out their models and raise a round from angel investors, the turbulence in the aftermath from the Brexit vote may not have an immediate effect, but this could be the calm before the storm. 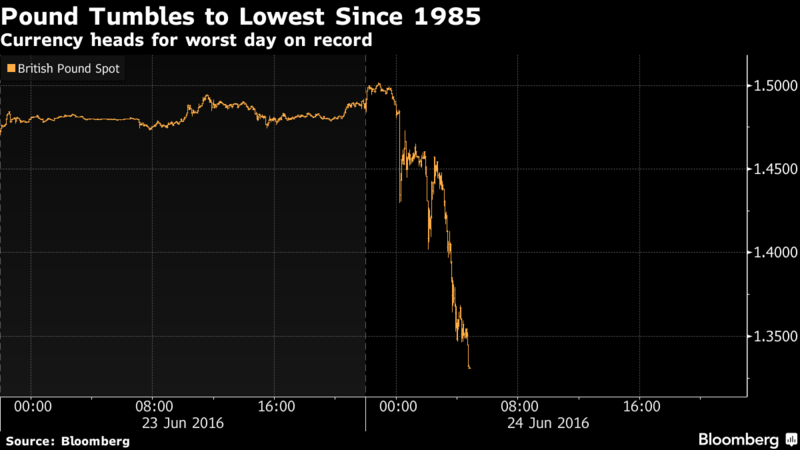 In the immediate aftermath of the vote, the pound hit lows not seen since 1985 against the dollar, trading at 1.25. The net effect of this volatility signals a decline in the equities market. The stock of Naspers, for example, cross-listed at the London Stock Exchange and Jo’burg Stock Exchange is definitely affected. In fact, the pound dragged the South African Rand down with it. Such shocks shake investor and shareholder confidence - even though the laws of physics promise that what goes down can go back up again. London has positioned itself as the startup capital of Europe. In 2015 alone, it cumulatively received over $1.9b for startup capital. The City's Old Street Roundabout has even been dubbed the 'Silicon Roundabout', thanks to the large number of tech-related enterprises that have sprung up in the area. London has positioned itself as the best alternative place for top tech talent and investment after Silicon Valley. Coupled with a vibrant capital market and bourse, many startups, especially those from the global south are looking at listing from there. In the recent past African tech startups that have managed to make waves beyond their own shores have been able to solicit funds from American and European funds and investment companies looking to get in on the continent's sustained growth. Most notably is the recent $83 million investment by AXA for an 8% stake in Africa Internet Group. This widely popularised development birthed the very first startup unicorn valued at over $1.2 billion. The most feasible step for AIG is to consolidate its position and possibly go to the IPO celebrity territory. The most probable bourse for this the London Securities Exchange, due to its salient features and positioning. Ultimately, investors are increasingly paranoid post-Brexit, with some having badly burned their fingers betting on a 'Remain' vote. The smallest moves in the market could be blown out of proportion, with short-term blips confused for long-term trends. When insurance market leader Aviva, for example, suspended a $2.4bn property fund, investors would say that things don’t look good in the interim, and they use this as a justification to sell. This could be the first of many other trading deals falling through, or it could be an aftershock from the market righting itself. Perhaps the biggest potential upside in all this for Africa's tech players is that the UK's government, through its development department DFID, is still pushing money into tech companies. They have previously done this with pay-as-you-go solar product makers M-KOPA and Fenix Intl among others. With more resources in their pool, probably more funding will be coming Africa’s way, but this would be a very long shot.